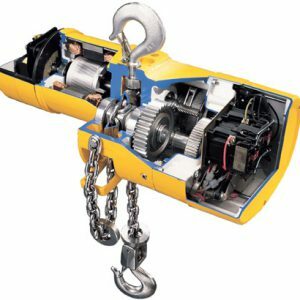 Chester Electric Low Headroom Chain Hoists are designed for those applications where headroom is limited. Engineered around proven designs, these hoists provide smooth, quiet trouble free operation in a variety of Class III applications. The units are equipped with worm drive gear reducers, case hardened load chain and are available in capacities from 1 through 25 tons. Choices of lug mounted, push/pull, hand geared or motorized trolley drives are available to meet a variety of applications. two precision bearings per trolley wheel. 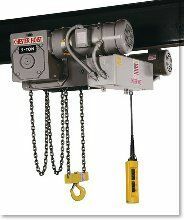 This hoist design permits adaptation to a variety of applications and can be custom built to meet the end user’s specific needs. Common control circuit options include, nonstandard voltages, fuses, TOLs, current load limiters, trolley soft starts, two speed or variable speed operation, inching circuits, encoders and additional limit switches for hoist and trolley travel. 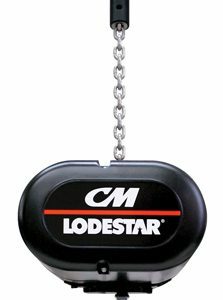 CATALOG NUMBER RATED CAPACITY IN SHORT TONS STANDARD LIFT IN FEET ** MINIMUM RADIUS CURVE MINIMUM DISTANCE BOTTOM OF I-BEAM TO HOOK IN INCHES HOIST SPEED (FPM) MOTORIZED TROLLEY SPEED (FPM) MOTOR (H.P.) (RPM) NET WEIGHT, LBS.